Sign up for the perfect opportunity to get your company and the latest products in front of the largest convenience store buying group in the country: 7-Eleven Franchisees! Become an exhibitor at the two-day NCASEF Trade Show, or gain more visibility throughout the four-day event. Our annual convention and trade show attracts 7-Eleven store owners from across the country in one venue, providing a unique opportunity to directly interact, network and sell to them. If you sign up for the convention preceding the trade show you will gain the full benefits of participation with more elbow-rubbing opportunities! Bring Plenty Of Order Forms! 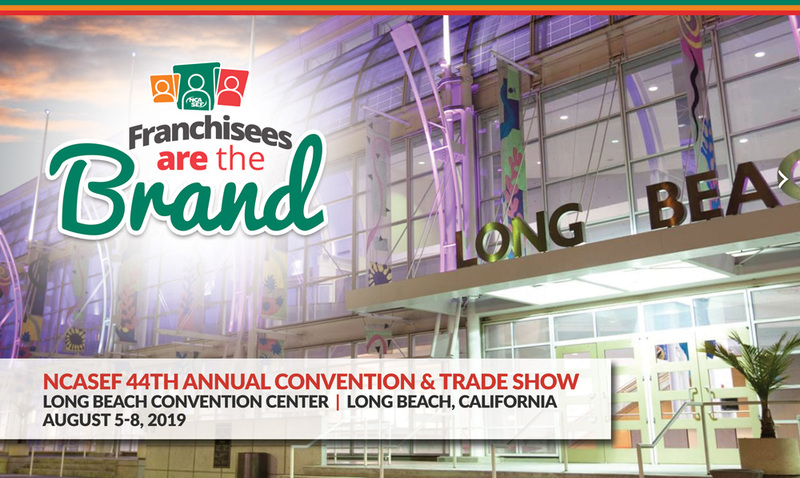 Last year’s trade show was highly successful for our exhibiting vendors with record attendance by our franchisees, already the convenience store industry’s #1 buying group! Franchisees again will be ready to buy at this year’s show, which promises to be bigger and better than ever. So bring your best-selling products and special deals, and be ready to make an impression! This year’s convention and trade show will be held at the amazing Long Beach Convention and Entertainment Center, an urban waterfront destination perfectly positioned in the nation’s second largest metro market. Overlooking bustling Rainbow Harbor, Queensway Bay and miles of sandy Pacific Ocean beachfront, the Center sits in the middle of Long Beach’s downtown waterfront. The Center features more than 400,000 square feet of flexible exhibit and meeting space, two theaters, four ballrooms, an arena and 34 multi-purpose meeting rooms. Wednesday, August 7, 11:00 a.m. – 4:00 p.m.
Thursday, August 8, 11:00 a.m. – 4:00 p.m.
Space rental for 10′ x 10′ booth: $5,000 per booth. Vendors purchasing trade show booths are entitled trade-show only access. Full individual registrations must be purchased. Exhibitors must register ALL personnel who will be present at the convention. Full vendor registrations beyond those earned through sponsorship are $250 each. Trade-show-only staff are free, but must register and have a badge. Full vendor registrations include access to all sessions (except franchisee only), to include, all breakfasts, Monday night welcoming reception, Wednesday evening cocktails with dinner and entertainment upon the historic Queen Mary along with an invitation to join our Thursday evening Grand Banquet and Charity Event. All orders for booth space are date-stamped and will be assigned on a first-come, first-served basis. Booth registrations received by this date will be included in the Exhibitor’s List and Schedule of Events. After this date staff must register on-site at Long Beach Convention Center. Please complete booth and staff registrations by July 4, 2019. Exhibits can be installed from 8:00 a.m. to 5:00 p.m., Tuesday, August 6, and from 8:00 a.m. to 10:00 am on Wednesday, August 7. All exhibit materials must be removed from the Long Beach Convention Center trade show area immediately following the show on Thursday, August 8. All shipments must be prepaid. An Exhibitor Service Manual with order forms for furniture, decorations, photography, electrical, labor, and shipping instructions will be provided by Freeman Decorating, Inc. upon receipt of your booth registration. Convention rates are offered Monday to Thursday, August 5-8, with checkout on Friday, August 9, by 11 am. Rooming options other than those dates will default to the hotel rate for additional days. Upon booking your reservation, your credit card will be charged a deposit equal to the first night’s room and tax. To avoid forfeiture of deposit, please ensure all changes and cancellations are made at least 72 hours prior to scheduled arrival date. A daily resort fee (subject to applicable tax) will be added to your reservation upon check-in. Looking for even more opportunities to make a big impression with franchisees? Consider becoming a Major Sponsor, for increased visibility throughout the show.